Note: The basic 273-360ci engines, produced since the mid-1960's, have remained relatively unchanged as far as the valve train is concerned. 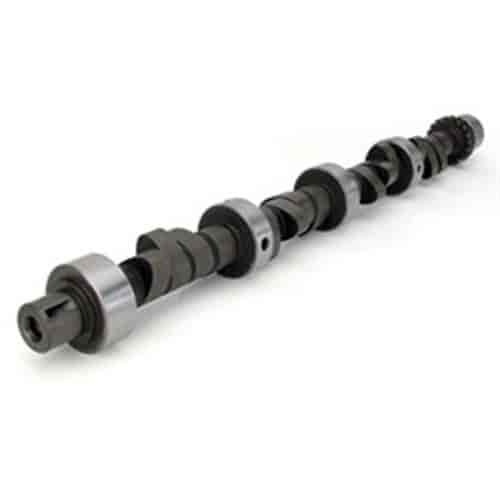 The 1964-91 engines used shaft type rocker arms which required some special changes in the camshaft design to allow oil to flow to the top of the engine and into the rocker arm shafts. Most of these early engines featured either grooved or offset holes in the third and fourth cam journal. In some instances a combination of both grooves and holes were employed. You must remember that if your engine has shaft type rocker arms there must be some groove or oiling hole combination on the cam journals. Chrysler began producing engines with hydraulic roller cams in 1986. These early roller cam engines still used the shaft mount rocker arms and had oil holes in the #2 and #4 bearing journal. Early 1986-91 318ci/5.2L and early 1987-91 360ci/5.9L engines equipped with hydraulic roller camshafts and lifters will allow conventional hydraulic, mechanical or roller camshafts and lifters to be installed in these engines, providing the appropriate components are used. In 1992 the new Magnum ''A'' engine was released using a pedestal style individual mount rocker arm design that oiled through the pushrod and did not have oil holes in the cam. There were also two different styles of snouts on the cams, the longer snout (.950'' from the first step) accommodates a fuel pump eccentric and the upper timing gear while the shorter snout (.650'' from the first step) came in the fuel injected engines that do not use a fuel pump eccentric. Using the wrong cam core will result in engine failure. It is very critical that the new cam match the old cam's characteristics. Replacement for H.P. 340 & 360 4bbl motors. Noticeable idle in 318. Works with 3.23-3.55 gear, dual exhaust & 9:1 compression. Does COMP Cams 20-212-2 fit your vehicle?